Just another Manic Monday getting ready for the annual Songkran Road Trip to Khao Yai and this time Kabinburi for the last two nights. We always close The Golf Club for a week this time of year to avoid any issues with the big party and to give the staff a paid week off. This is our rest period after the high season and before we start our spring cleaning routine, so something we all look forward to. It was a slow start to Green Valley as we were held up in traffic due to the King’s Bike Race in the area. They had closed off sections of the road so we lost about 30 minutes on the way. There was no time to waste so a quick change in the locker room and off we go for the usual 9:28 slot. Andy and Bob were on a dead heat for most of the round and finished that way with 36 points each. Just like last week, Walter turned in a very entertaining round and fruitful with a 37 on the card. It was all Walter today and the 37 took home the win. Meanwhile Alan Akehurst was all over that near pin. Yes that’s right, we played on Wednesday! 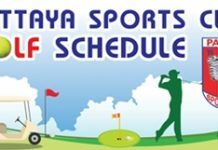 Due to the Songkran getaway to Khao Yai on Friday, it was a different schedule this week and allowed us to experience a course we don’t play in the high season, Burapha. It was a cool morning for this time of year and we have had a “cool spell” for the last few days with low humidity that has been amazing. It is not like April at all, fortunately. The course was in great shape and Sports Day makes it great value also. We were assigned the A & B tracks at 6,130 yards and the lads said it was just a fine day of golf. Deep rough around the greens was the only bit of dissatisfaction. We welcomed “Ginger Ben” Wilkinson to the fold and the last two weeks has seen Ben turn in some good rounds, but just miss the podium. Today he was in great form and shared the win with the very steady Walter Baechli who has had a spate of good cards fall his way. Bob Catlow also took the near pin and thankfully missed that elusive birdie putt.